1882: Happy 136th Birthday, Henry Burr! 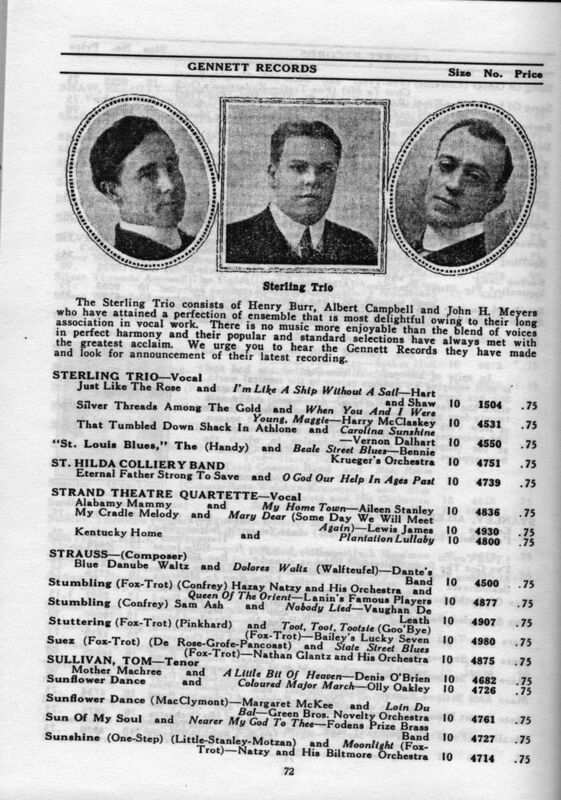 (1/15/1882) The vocalist recorded several sides for Gennett with the Sterling Trio. This photo is from their entry in the 1923 Gennett Catalog. 1925: The Tweedy Brothers recorded “Cripple Creek” in Richmond. It appeared on Gennett 5635, Champion 15148 (Jennings Brothers), Silvertone 4008, and Buddy 8016. Champion reported sales of 1,532 copies in 1926 and 1927. The Tweedy Brothers were Charles W. Tweedy (piano) & Harry Tweedy (fiddle).